Just got home from my first Body Shop at home party. It was so much fun. It was a foot spa party and we all got to soak, scrub and lather our feet with lots of yummy scrummy products. Man I love this stuff. Smells so good, feels so good. I have fallen in love with multiple products. 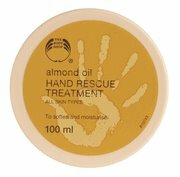 There body butters feel like silk and this awesome hand rescue treatment (See above) which made my hands feel so soft. So I bought some! Wanted to buy so much more but had to restrain myself. But I've made a big list of all the things I like and am heading to my local Body shop every payday from now on. 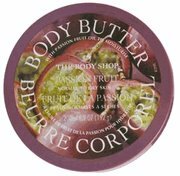 The first product on top of my want list is the Passionfruit Body Butter. Smells and looks so good I could eat it. So I am off to sleep now that I'm relaxed and smelling goooood!! Megan...I love their products too. Jessica....Brian's fiance(from ourCJ)use to run those parties and as far as I know she can still get the products at a discounted rate. Give her a peamail and she'll let you know.I think she is off to Coff's Harbour again this weekend for Uni. Mmmm... I used to love The Body Shop. Haven't been in there for ages. I remember that they used to make fruit shaped and scented soaps that I used to buy a lot as a teenager. Are you going to have a party? Can I invite myself if you do? Ops, sorry...trying to say ... I love Body Shop products too. I used to use the cocoa butter on my cracked heels, and it was divine!